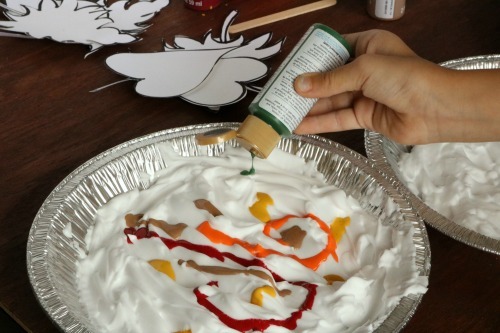 This Shaving Cream Paint craft is fun to do with kids on a lazy afternoon. As they dream of cooler temperatures, they can create fall leaves as sweet reminders of the beautiful colors of autumn. You can do this with toddlers and above. 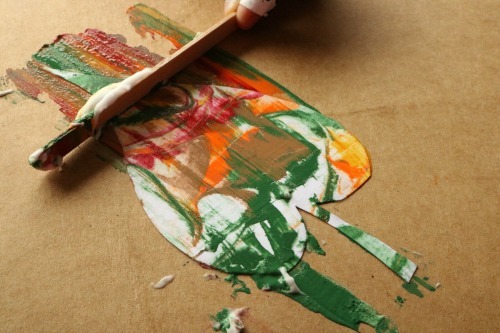 The ingredients are non-toxic, but the paint can stain clothes. So make sure that everyone wears their art smocks. 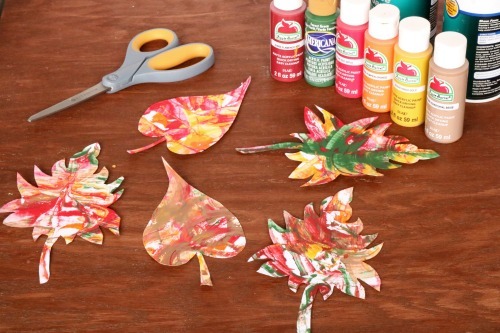 If you do this craft with older kids, have them do research on different trees that lose their leaves in fall. Then let them choose the types of leaves they want to design. Then have them cut out their favorite leaves. This is a great time to talk with the kids about how the trees are preparing for winter. The leaves change color because it’s time for the tree to seal off those leaves and stop making food. The tree grows new leaves again in spring when there is once again plenty of water and sunshine to begin the food-making process inside the leaves. Are there trees in your yard that lose their leaves? What types of other trees grow around the area that also shed their leaves in fall? How are the leaf shapes different? Oak and maple leaves have beautiful and unique shapes. 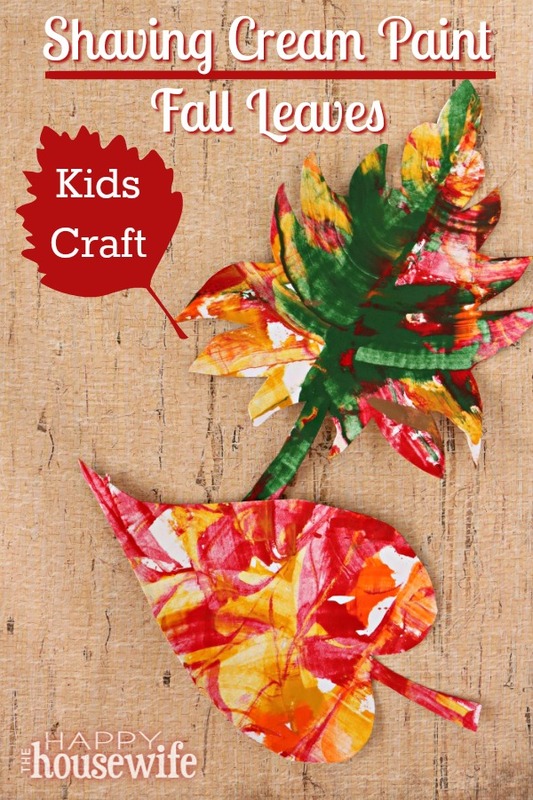 Big leaves and small leaves may fall from trees, and varying sizes work perfectly for little hands. 1. 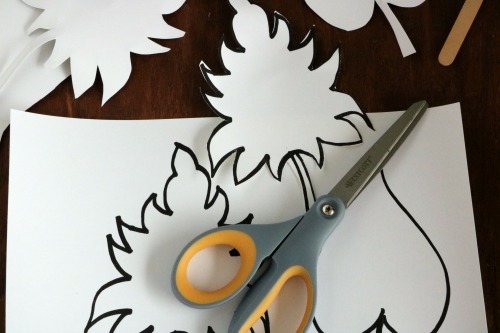 Trace (or draw) and cut leaf shapes from card stock. If you’d like, you can use the shapes my daughter drew. 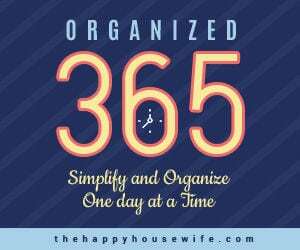 Download here and print directly on your card stock. 2. 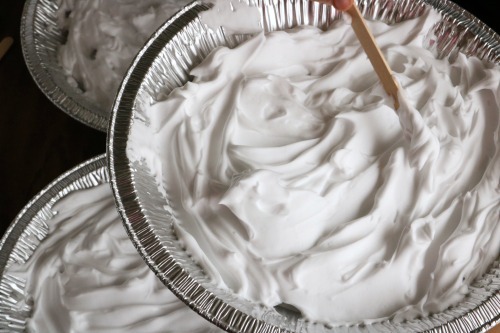 Put shaving cream in a shallow pan and spread it out to coat the pan. 3. Squeeze lines and spots of paint into the pan. Make sure to use contrasting colors to create dramatic differences and unique looks for each leaf. 4. 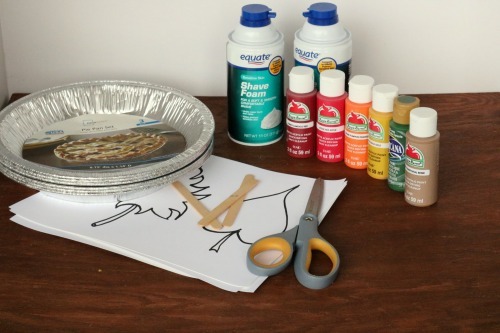 Use your fingers or popsicle sticks to create swirls. 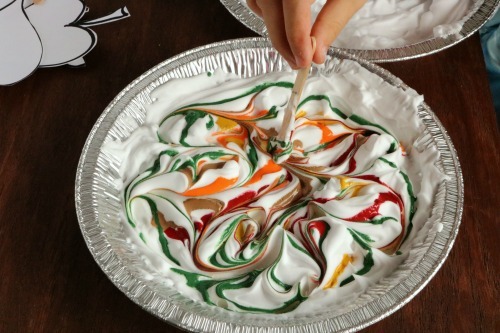 Make sure to explain to the kids that there is a difference between swirling and mixing. We are not trying to blend the colors but to create fun patterns of movement. 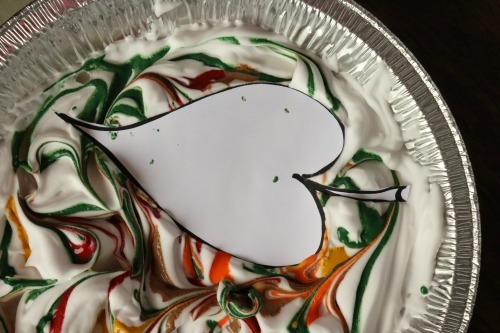 If you have enough pans, it would be great fun for each child to create their own swirling paint pattern. 5. 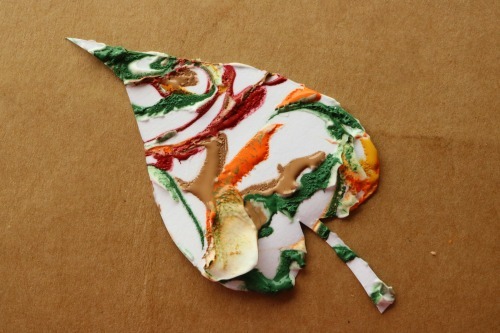 Press a leaf cutout into the swirled shaving cream. 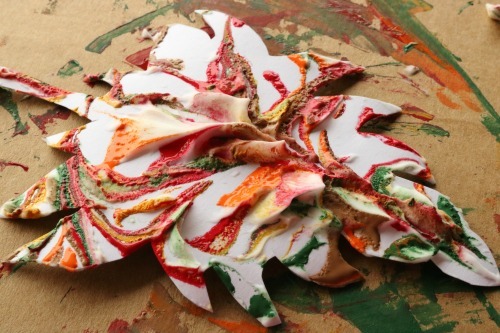 Press straight down to keep the paint from smearing or mixing too much and distorting the pattern. 6. Pull the cutout straight up out of the paint. Place it on some scrap cardboard or newspaper. Wait 30 seconds. 7. After the paint has had a chance to dry just a little, scrape off the paint from the cutout with a popsicle stick. You can try scraping in different directions for varying effects. 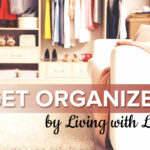 Allow the cutouts to dry completely. Repeat with all the leaves. Enjoy your new reminders of autumn and treasure the season you’re in! Brilliant! I see fun with the grand kids coming up!